Winter is just around the corners, and while most drivers know well enough to equip their vehicles with winter designated tires so the incoming inclement conditions, some regional roadways and mountain passes are particularly treacherous and unpredictable – warranting more help than a set of winters. Tire chains are a time-tested addition to winter tires, and provide monumental grip in both ice and snow conditions. They’ve been used on mechanized equipment for generations, and provide extra peace of mind to motorists on bad winter roads, providing safety and confidence to drivers, and other motorists on the road. Tire chains are popular for their effectiveness on ice and snow, inexpensive price point, and their non-permanency. They provide excellent traction in conditions with deep snow and ice, biting into the surface with steel links of chain taking the place of – or aiding – traditional winter tire treads. Tire chains are not required on all roads or highways in the province and this causes their use and the protocol around them to become cloudy over time. 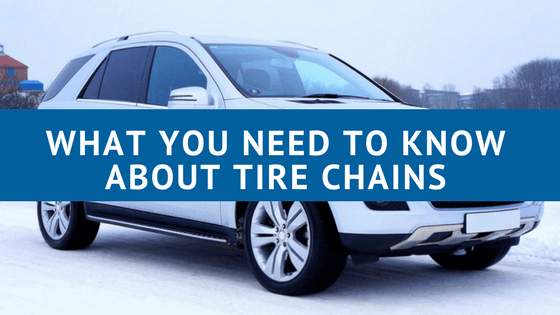 In this post, we’ll shed some light on the rules surrounding tire chain use, where they are mandatory, where they’re not, and whether or not they’re useful to winter driving. The province of British Columbia is laden with snow and ice during the winter, coupled with a mountainous terrain. This makes driving in inclement weather conditions particularly harrowing on mountain passes and on highways during the cold months. The province’s website states that chains may be placed on a passenger vehicle’s primary drive axle to provide superior traction in ice and snow. The province also enforces mandatory winter tires or chains on certain routes from October 1 to March 31 as a precautionary measure for accidents and slippery road conditions. These routes are regulated by signs placed on numbered and unnumbered highways and are enforced by local police, ministry, and other enforcement agencies. It is recommended that drivers carry tire chains with them when traversing mountain roads and passes. The province also recommends that all commercial vehicles employ use of steel link tire chains in winter weather, while cable-style chains are also permitted “if used in conjunction with steel link chains,” as they don’t typically provide the right amount of traction on roads with banked curves, encouraging slides in some cases. Those found without winter tires or to be carrying tire chains can face a fine of $109 if your vehicle is not properly equipped for winter road conditions. Where Can You Drive With Tire Chains? The October to March regulated dates for winter tire and chain routes in all held conveniently on the province’s website, where routes and comprehensive maps can also be found. In Northern BC, nearly all highways and mountain passes are designated as winter tire or carry chain routes, with minuscule highway routes near Prince Rupert and Terrace on the mainland, and a section near Masset on Haida Gwaii. On the South BC coast, including Vancouver Island, about half of all highway routes are not designated as winter tire or carry chain routes – predictably around the city centres of Vancouver, Victoria, Nanaimo, Powell River, and inland towards Hope. As we progress towards the southern interior region of the province, we can justifiably predict that nearly all highways are still designated as winter tire and carry chain routes. Very small sections near Kamloops, Merritt, Revelstoke, Sicamous, and Cranbrook are the exceptions. There are typically two types of tire chains: classic chains, sometimes known as cables, that drivers must drive onto to wrap them around the tire, and wrap-style chains that can be wrapped around the tire once it’s in the snow. Most premium chain products are the easiest to install, while discount versions often require additional rubber tighteners to keep the chain secure against the tire. Most tire chain manufacturers recommend that drivers do not exceed 50 km/h when using tire chains, but in the types of weather conditions that prompt use of chains, we suspect that will be plenty fast enough. It goes without saying that tire chain installation is typically undertaken once a driver has a problem in the snow, and that can make installation difficult. This is why we always recommend that drivers check the road conditions and forecast prior to leaving on a road trip, or an out-of-town ski adventure – and have ample experience installing their snow chains prior to needing them in an emergency situation. As an additional precaution to a good set of dedicated winter tires, tire chains are a formidable help when it comes to deep snow, and icy conditions. They provide confidence, sure-footedness, and add safety to a driving scenario that can be tricky, to say the least. Couple that to the fact that they’re usually inexpensive and simple to install, and you’ll see why we believe them to be a useful and smart purchase prior to the snow’s arrival.